I first read about Huguette Clark on Facebook in 2011 when she passed away and the headlines screamed that she'd left her fortune to her nurse. I remember thinking that it was likely her family didn't take much interest in her until after she'd died and a nurse who cared for her for 20 years would probably seem more like family anyway. According to authors Bill Dedman and Paul Clark Newell, Jr., I was right. 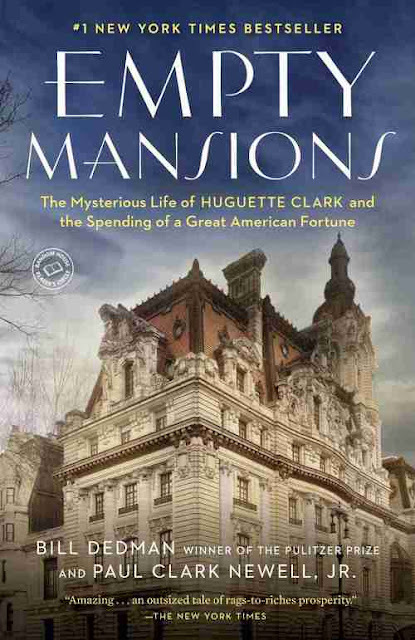 Empty Mansions: The Mysterious Life of Huguette Clark and the Spending of a Great American Fortune is a non-fiction book chronicling the lives of heiress Huguette Clark (1906-2011), and her father, copper baron and United States Senator William A. Clark (1839 – 1925), one of the wealthiest men in the world in his time. It's a stranger-than-fiction story of both William and Huguette's lives, including healthy, able, and very very rich Huguette's choice to spend the last twenty years of her life in New York City hospitals. I really enjoyed this excellent story that spanned the lifetime of the two long-living individuals. I've spent the last few days experiencing 172 years of history---the lifespan of this father and daughter. Unimaginably, Huguette lived long enough to remember and narrowly escape the sinking of the Titanic in 1912 AND the attack on New York's Twin Towers in 2001. I love reading stories about America's "Gilded Age" and this one is probably as good as it gets. I can't even imagine what it would have been like to have so much wealth that...well, I could do anything. Yet Mrs. Clark, in my opinion, lived humbly and with integrity. Still, her generosity didn't always have the greatest consequences. For instance, her nurse takes no issue with admitting that she gave her life away to care for Huguette---missing many years of her children's growing up time and putting her husband in a position that he didn't feel the need to or see the point in earning a living to support his family. It would be difficult to know who was a true friend in that situation, I think. There's so many neat and interesting bits of history in this book---especially nuggets of art history, which I love. It was also fun to see the many photos included. The publishers followed up with a great website about the book full of more photos and info. Do you have a favorite Victorian or Gilded Age book? Let me know! 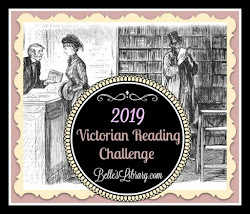 Victorian Reading Challenge at Becky's Book Reviews for "Book About Property, Inheritance, Economics"
Full House Reading Challenge for "You Didn't Want to Put it Down"
It sure was! Super readable, too. Oftentimes, nonfiction (especially biographies) can get a little droning, but I was engaged from the time I started it.